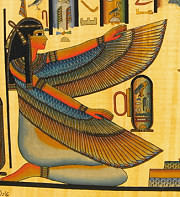 Was a goddess in Ancient Egyptian religious beliefs, whose worship spread throughout the Greco-Roman world. She was worshiped as the ideal mother and wife as well as the matron of nature and magic. She was the friend of slaves, sinners, artisans, the downtrodden, as well as listening to the prayers of the wealthy, maidens, aristocrats and rulers Isis is the goddess of motherhood, magic and fertility. 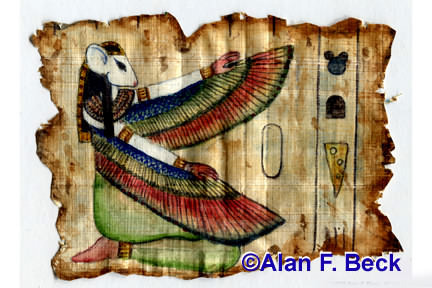 Water color on papyrus 6" x 4"
Based on a tomb painting of Isis, a goddess in Ancient Egyptian religious beliefs, whose worship spread throughout the Greco-Roman world.